A tiny dog treated at the University of Florida Small Animal Hospital for a life-threatening heart condition is recuperating at home after receiving a procedure often performed in human medicine but believed to be the first of its kind in veterinary medicine. A team of human pediatric and veterinary cardiologists from UF collaborated on the successful endeavor to save Rumple, a 2-year-old Havanese weighing about 14 pounds and owned by Ligia Sandi of Coral Springs. 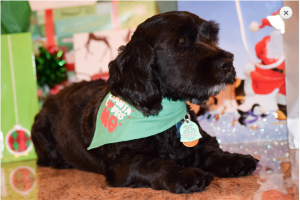 Sandi brought Rumple to the UF veterinary cardiology service in April with a condition known as severe pulmonic stenosis. It involves a narrowing of the pulmonary artery and obstructs blood flow from the right ventricle of the heart. At UF, veterinary cardiologists typically treat 10 to 15 dogs a year with pulmonic stenosis by passing a catheter from a vein through the right ventricle into the narrowed part of the artery, then using it to guide a balloon that is inflated to relieve the obstruction and allow normal blood flow to the lungs, said Simon Swift, D.V.M., an assistant professor of cardiology at the UF College of Veterinary Medicine. However, that standard approach did not work with Rumple. “Rumple had an unusually thickened right ventricle with an abnormal tricuspid valve, which meant the catheter/balloon technique was impossible to achieve,” Swift said, adding that his team initially attempted to treat Rumple this way but was unsuccessful. The dog’s care team considered using a valve stenting technique or a surgical approach that would have opened up the dog’s artery, but ruled them both out, Swift said. Then he came up with another idea. The technique is commonly used to treat the condition in young human patients, he said. Swift assembled a team that included Curt Fudge, M.D., an assistant professor and director of the Pediatric Interventional Catheterization Laboratory at the UF Health Congenital Heart Center; Himesh Vyas, M.D., an assistant professor of pediatric cardiology at the center; andMauricio Dujowich, D.V.M., an assistant professor of small animal surgery at the UF veterinary medical college. Once Rumple’s chest was opened surgically, the medical team used ultrasound to determine where to place the needles and wires needed to allow the most straightforward access for the stent. They positioned the stent, inflated and deflated the balloon and tested their success by using contrast dye to verify that the obstruction had been cleared. Rumple recovered well from the surgery. The next day, using echocardiography, Swift was also able to measure a huge reduction in blood pressure, providing further evidence that the obstruction had been removed. Rumple’s owner said her “baby” is doing well and her family is happy to have him home. “He’s feeling like his old, happy self for the most part now,” she said. “We are doing everything that we can to ensure that he has a long, happy life with us and he will be very well-loved and immensely spoiled.” She called the UF team “heroes” and thanked everyone who came together to save the dog her family rescued off the streets in late June 2015.